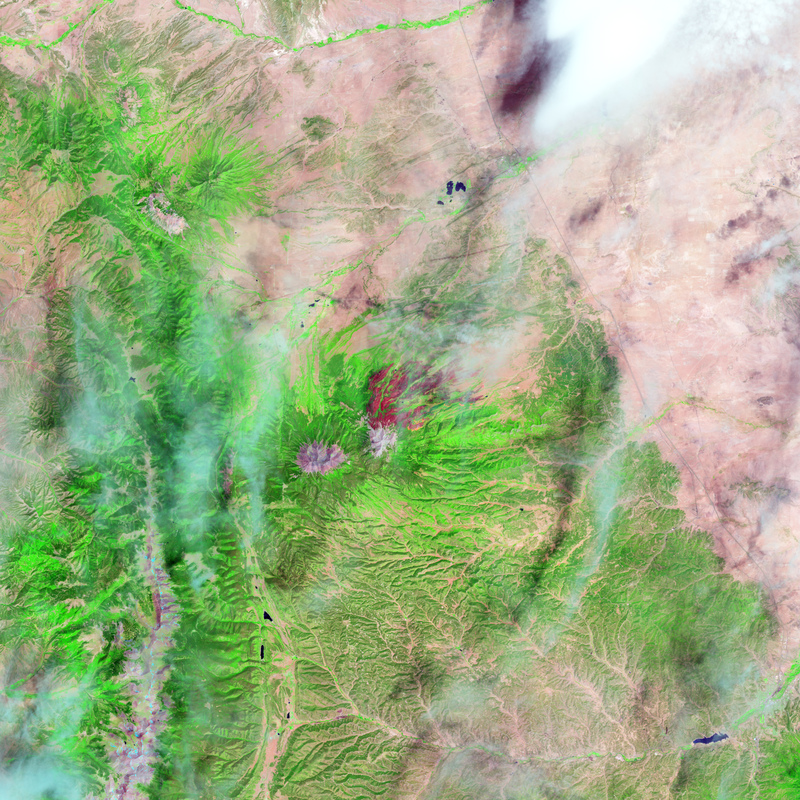 On June 22, 2013, the Operational Land Imager (OLI) on Landsat 8 captured this false-color image of the East Peak fire burning in southern Colorado near Trinidad. 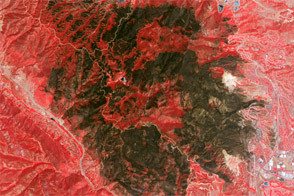 Burned areas appear dark red, while actively burning areas look orange. 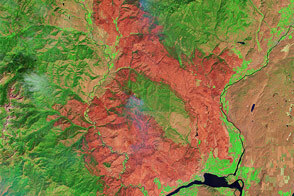 Dark green areas are forests; light green areas are grasslands. 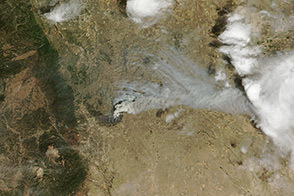 Lightning ignited the blaze on June 19, 2013. 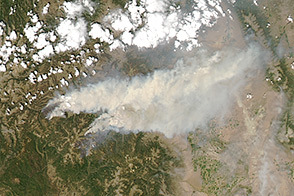 By June 25, it had burned nearly 13,500 acres (5,500 hectares). InciWeb (2013, June 24) East Peak. Accessed June 25, 2013. Denver Post (2013, June 23) East Peak gets a controlled burn from firefighter in Colorado. Accessed June 25, 2013. 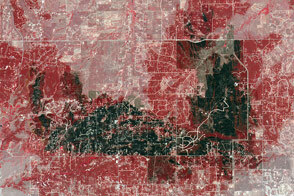 NASA Earth Observatory image by Jesse Allen and Robert Simmon, using Landsat data from the U.S. Geological Survey. Caption by Adam Voiland. 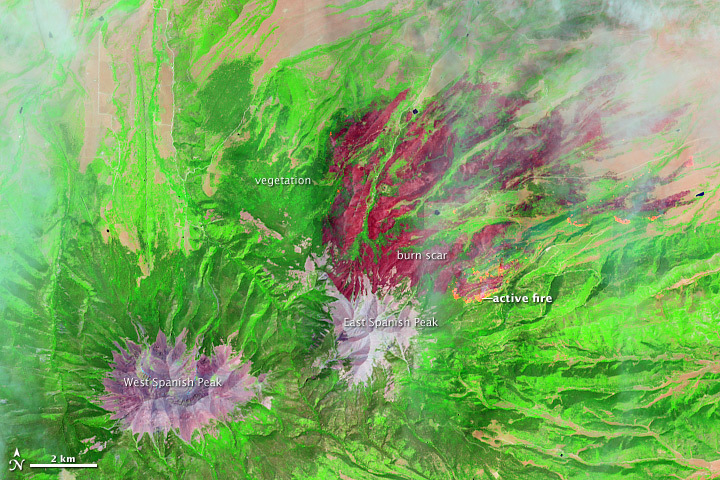 Landsat 8 acquired this false-color image of the the East Peak fire in southern Colorado on June 22, 2013. 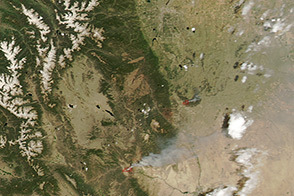 A gallery of notable fires in Colorado during 2013.